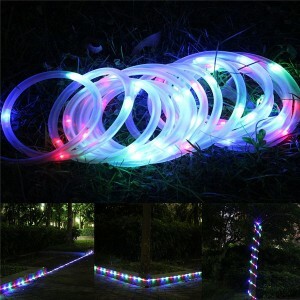 Decorate your home or garden and create a wonderful ambiance with this Festive 50 LED rope light. The 7 meter long multicoloured rope light features 50 energy-efficient LED micro-bulb lights, suitable for both indoor and outdoor use. Put on wall,window, door, floor, ceiling, grass, Christmas tree or building, Add perfect atmosphere to your place. Ideal for home, garden, weddings, Christmas decoration etc.